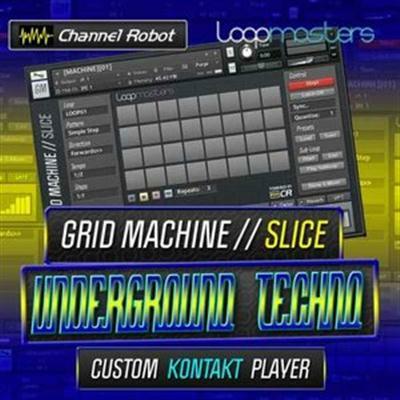 Loopmasters and Channel Robot are very proud to present another in the series of Grid Machine//Slice products for the Kontakt Sampler which combines Channel Robots unique instrument in the Kontakt environment with the cutting edge samples from Loopmasters sound archives. Featuring a powerful collection of samples for techno and minimal producers looking for up to the minute royalty free sounds to complement and crystallize their productions for the dance floor.. With over 200 of the highest quality loops If you are looking to ignite your sound with some fresh key sonic elements which will no doubt be used on countless charting hits, get ahead of the field and sample some of these original and royalty free minimal techno samples from Loopmasters. Cut, Chop, Stutter, Reverse, Mix, Modulate and of course slice with Grid Machine//Slice Underground Techno in Slice Version 2. A unique powerful new type of loop altering tool to Bend, Twist and re-create your loops all in real time. Featuring the highest quality loops every one of which can be re-programmed into hundreds of totally different sounds. Now this great value set comes with Grid Machine//Slice Version 2 allowing you to create and build your own stuttering, fading chopped loops and glitch sounds from any of the included material, every loop can be cross mixed with up to 11 others, variable repeats (stutter), reverse and mute effects, user designed pattern structures, random slice playing - for ever changing loops, volume envelopes and featuring EQ, Filter, Distortion, Lo-Fi, Phaser, Flanger, Delay, Reverb, Chorus, Pan, Tremolo, and Vibrato effects, all connected to an independent set of highly controllable modulators - that now modulate every FX parameter. 100's of different ways to slice(re-order) each loop, plus you can play these patterns forwards, backwards, forwards and backwards, half-speed, double speed, and skip slices. There are literally thousands of different ways to play each of the included loops. Retrigger a loop any time you like from any slice, play sub-loops, latch on a single slice, time changes, design your own playback patterns, save and reuse them, and loop re-triggers to bar and beat all from your keyboard or the user friendly GUI inside Kontakt. Tempo sync'ed to your song in your DAW or play as a stand-alone instrument. Grid Machine//Slice places unique creative and playable features right at your fingertips, and on your keyboard (using its extensive key-switch system). Libraries of loops will never be the same again.